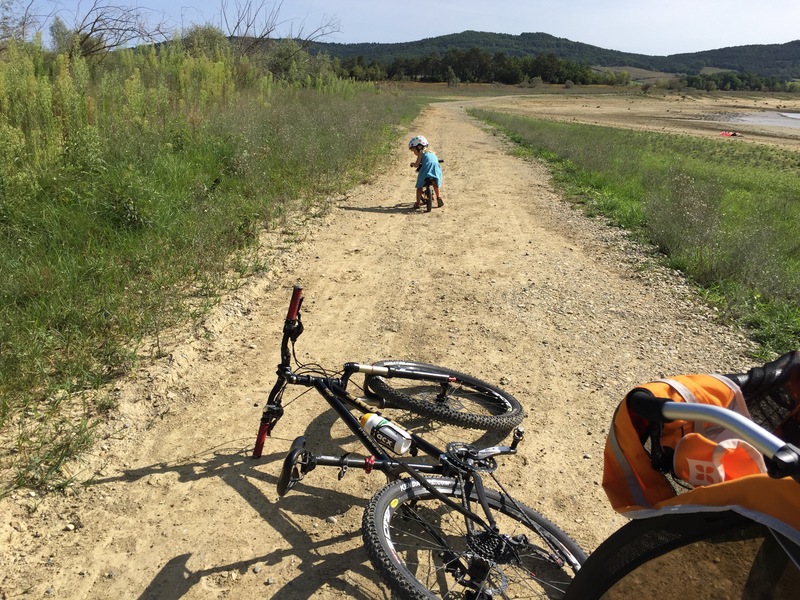 With the end of the grandes vacances rapidly approaching, I realised I had utterly failed in all of my cycling missions, namely to tick off a few sections (at least) of the Mirepoix-Lavelanet voie verte and also to ride around Lac de Montbel. Both routes are pretty local to me so with a few not-so-hot weather days showing on the forecast I decided to go for it, with Montbel top of my tick-list. The VTT Pyrenees website lists two main routes around the lake that I figured could be tweaked then reccied for their trailer-friendliness. Route 14, from Chalabre, following the voie verte north then taking a track down to the lake via the village of Montbel – 17km in total, classed as Circuit Familial, graded blue. Route 16, which could also be started from Chalabre, which more or less follows the shore of the lake – 32km in total and classed as Circuit Sportif, graded red. Since I wasn’t in the mood for tackling a major trailer ride on my own (James was having back trouble and didn’t want to ride and I hadn’t had chance to arrange anything with anyone else) we hatched a plan whereby he would drop me off on the eastern shore of the lake, by the village of Montbel, then drive over to the western shore to wait for us. We would picnic together once we arrived and, in the meantime, I’d get my ride and James would get some peace and quiet. James liked the idea, so that’s what we did. I also decided to strap DD’s balance bike to the back of the trailer as I thought it would be nice for her to have the option of riding too, if she felt like it. I didn’t bother plotting anything beforehand, no GPS tracks or anything, as it was going to pretty simple, at least that’s how it looked from various maps, so I just set off with the plan to keep the lake on my right and ask for help/directions along the way whenever I wasn’t sure! One of the things I had no idea about was whether the route would be trailer friendly. There was no indication of such online so I was going to have to ride it to find out. I started to have my first doubts about this within a few minutes of James pulling off in the car when confronted with a steep and sandy bank with a gap only just large enough to fit the trailer. Thanks to the timely arrival of some helpful (and somewhat skeptical) walkers we made it up and over and were on our way. Only a few minutes in and I was already starting to wonder whether this route would be good with the trailer. The path the other side was narrow, not something I’d have worried about usually but given I’d only managed to get a few hundred metres from the start thanks to assistance I was really hoping it would get better. The narrow path was nice for me to ride on but it meant the trailer wheels were dragging a bit on the grass either side and my two passengers were getting bumped around a fair bit. I wasn’t sure they’d tolerate that over 7 miles. Luckily, the first of four dams quickly came into view and the path opened out. So far so good. The next section of the route was pretty nice to ride, wider for a short while and then into some woods, following the bank of the water. Lovely! I was just starting to relax when a bloke came hurtling out of the woods and, after a quick exchange of bonjours, started gesturing and saying, “attention!” (which the French say in the same way we would say, “be careful!” Hmm… I flagged him down and asked him what the problem was and he said to be careful because there was a difficult section coming up. Difficult how, I wondered. Then I spotted it. It was one of those fabulous dirt drop ins, a bit like a half-pipe, great fun to ride but not so great with a trailer in tow! I stopped, took a picture (which really doesn’t do the depth of it justice) then backtracked to look for a path that would take me round it. Of course, I wasn’t the first person to pass that way and not like the look of that drop, so there was a path, which I duly pushed the trailer round until I was back on the trail. First hurdle overcome. Yay, onwards! After that it was pretty easy going again. The track was nice and it was generally wide enough for the trailer to pass easily with the odd tree root to avoid, so it was a case of picking the most suitable line for the trailer so that the littles didn’t get bumped around too much. It was good fun! About half way to our destination a wrong turn delivered us to a section of the lake where the water was so low I ended up riding beyond the end of a track onto the hard-baked clay, which was interesting! The littlies weren’t too happy about it as it was very bumpy. I was keen to get off it in case there were any soft patches and I ended up stuck and dragging bike and trailer out of the mud. As soon as I was closer to where the shore would usually be I made for the obvious path. At this point, on a nice flat, wide track, it seemed a good point for DD to have a go on her balance bike. She had a short scoot then assured me that she was worn out and needed a rest – convenient because there also appeared to be some dinosaur-like tree stumps sticking out of the mud that were calling out for exploration. I’m fairly sure she’d have stayed on her bike for longer if curiosity hadn’t got the better of her. She really wanted to go down and take a closer look so we parked up, liberated DS, and wandered down to check them out. DD was playing with her new dinosaur friends while DS was more interested in the white cranes that we’d disturbed when we rode across the clay and were now coming back down to land near the water’s edge. With the water well out of easy reach to either of them it was a nice place to relax and take a break. After both passengers had had a reasonable run around and we were all topped up around for a few minutes, I bundled them both in the trailer so we could get on. We’d been gone about an hour and I didn’t want to be out all day in case the sun defied the forecast and came out in full force. Plus, James was waiting for us and I wasn’t sure how easy or hard the rest of the ride would be. I rode back towards where I thought the start of the trail was, had a moment of indecision, turned back the way I’d come, which turned out to be the wrong way (had there been more water it would have been an island), so turned tail again. At this point a small group on mountain bikes were heading my way, making me doubt my indecision! Had I’d missed a part of the trail? Was I in fact going the wrong way again? I stopped to ask if they knew the way, which they didn’t, told them I thought that was the wrong way, then showed them the map on my phone. They seemed quite convinced that I was going the right way, which I was relieved about. After a quick chat with them – about the trailer, the kids, the cycling, the low level of the water, and why I was in France – they set off again, back the way they’d just come, and I followed along. “Have we got some new friends now, Mummy?” DD asked. That’s my girl. 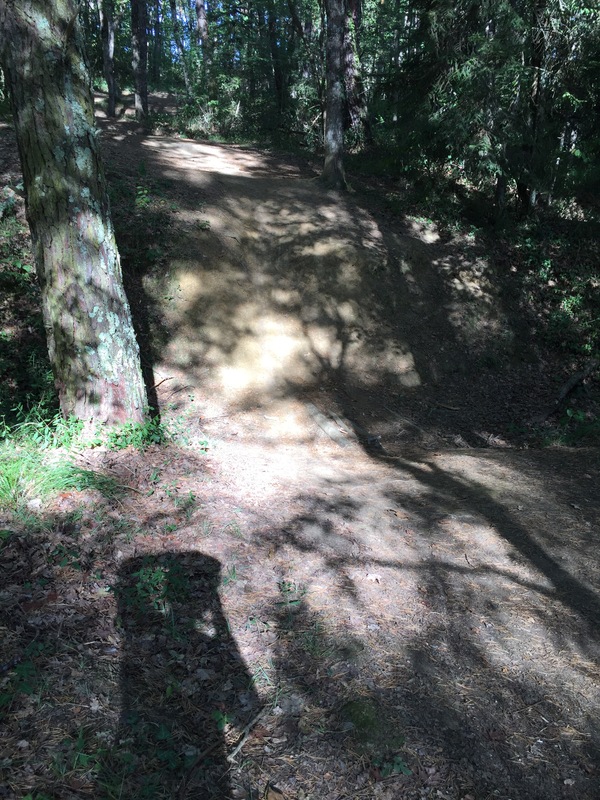 The next section, which I’d been dubious about taking when I first saw it, looked like it was single-track going into the woods. I knew from the map it had been made into a Strava segment so art of me was definitely a bit worried that it might not be good with the trailer. 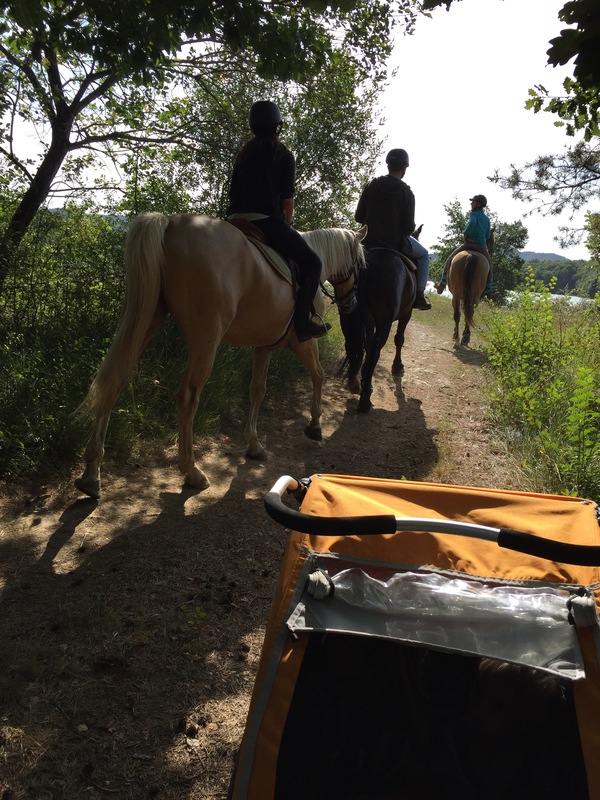 When I ride solo with the trailer I’m pretty good about asking for advice – generally I want to avoid getting lost or running into problems and, as a crowd was forming around the junction of this latest section of trail, I asked a few people whether it would be okay with the trailer. A few said, sure. One woman said that it was narrow in places and maybe the trailer wouldn’t fit. I didn’t understand everything she said but look on her face suggested she really didn’t think it was a good idea. Another was keen to convey that it was bumpy and not flat. Obviously, I’m the wrong person to tell that too! One of the men in the group I’d just met asked whether I was going to ride it. I shrugged and said I’d try – and we both laughed. With that my new group of friends set off and I followed. It didn’t take long for them to leave me behind but I found it reassuring that they were in front somewhere and also knowing that there were quite a few people out. The trail was nice to ride, having opened out a bit again, and tt was all going well. Then I reached a point where the trail split into two levels, running side by side, too narrow for the trailer meaning I had to keep one wheel on the higher track and another on the lower one. With the trailer at 45 degrees it was something of a challenge and it was at that point that almost resigned myself to ending my ride. I say almost. After checking the map, I decided to continue on until the next bend, pushing the bike, pulling the trailer (while also putting my weight on it to stop it tipping down the bank). If it had been hard beyond there I think I would probably have turned round but it turned out to be only a short section and we made it. DD was a little upset by it (she was on the side facing down the bank when it nearly tipped over) and DS, the trooper, slept through the whole thing! After that I was starting to wonder whether the next section would be too much but really didn’t want to have to turn back so asked a few people I came across what was up ahead and no-one pulled any faces or expressed any concern so I carried on. The trail opened up again. Nice. Time to relax and just ride. A fallen tree later, with help from another couple of cyclists, I was asking another walker for advice. How was the trail up ahead? “Fine”, said the woman (a mother who was with her young son who was riding his bike alongside). “Just watch out for the steep part.” Her husband was there wearing a black t-shirt and he would help, she said. Onwards, over some roots, riding through the woods, wondering when this next obstacle would present itself, I suddenly found myself grinding to a halt on a steep bank that seemed to come out of nowhere! Thanks to my mountain bike shoes and cleats I had enough grip to drag myself and the trailer up there in one go. Just. Once at the top, I found the couple that had helped me over the tree. 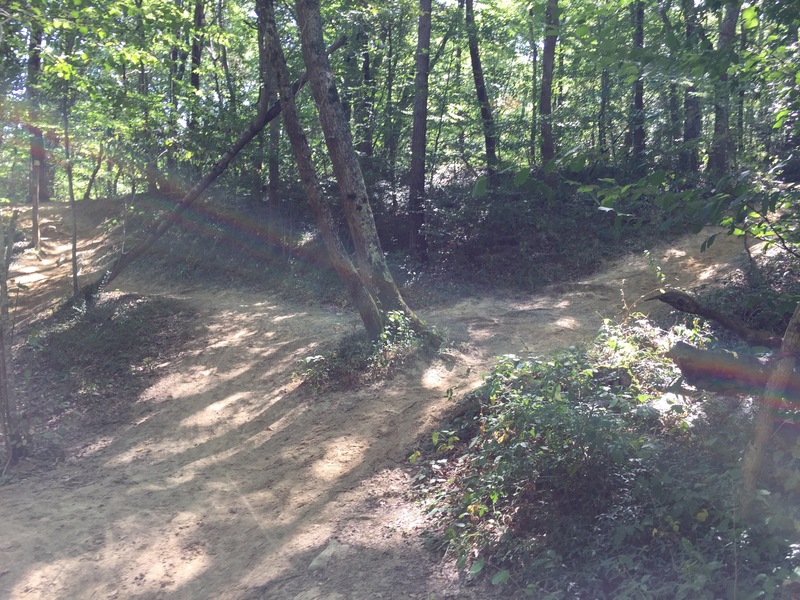 We all exchanged “phews!” over the steepness of the trail then I looked in dismay at the descent – a steep, lovely, rideable drop on the mountain bike that was completely inappropriate for a trailer carrying my two most precious possessions. Luckily the guy, who must have seen the look on my face, pointed round to the left where there was another path, which although still quite definitely down was not anywhere near vertical. I thanked him then set off that way – on foot. It was a bit rocky but the rocks were wide and smooth and it was easy enough to get the trailer over. Once the other side the trail continued as it had before. If the woman I’d spoken to before was right, that was the only bit to watch out for. Good – and according to the map, nearly at our destination. By now we’d been out for getting on for two hours including stops. As with all activities involving small people there’s a limit to how much can be done, so now I was keen to get back to base and have lunch before anyone started getting stressed or upset. A few more bends later and the final dam came into site. We made it – phew!! I called James, who was having a coffee at the restaurant, and headed down to meet him. He’d had a coffee and went off to get me one, then I suggested take out pizza. The restaurant on the Leran side of the lake does excellent pizza and I felt we’d earned it. After a very fine picnic – complete with fresh, hot, homemade pizza – we walked down to the water’s edge with our swimming gear. Sadly though it was not to be. 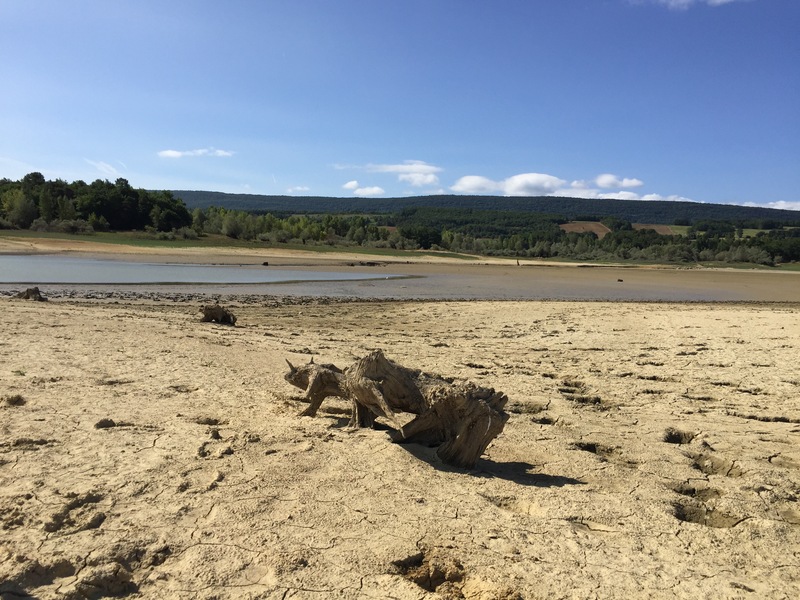 The water level is very low this year – hence my being able to ride on what should have been the bottom of the lake rather than the shore – which meant anyone wanting to swim would be standing on clay and rock with the bottom dropping away very fast. It wouldn’t be nice underfoot and isn’t safe for the little ones. We decided we’d had a good enough day out already and headed home. Thinking about the route afterwards, would I do it again? Would I recommend it as a trailer ride? Well, yes, I definitely plan to do it again. But only if there’s another adult with me. I needed quite alot of help, compared to other rides I’ve done with the trailer, and might have had to turn round or run into trouble if there hadn’t been so many people around. I was fine because it was a busy Sunday in August. On a quiet Wednesday afternoon at another time of year, I might not have been so lucky. Lucky for me I have some other bike-mad parent friends with a trailer and I’m pretty sure they’ll like the sound of it. I’ll recommend it to them, definitely and suggests they come with me next time! But that’s them. Anyone who isn’t excited by the idea of rooty paths and isn’t up for an offroad adventure would be better off sticking to flat or more sanitized routes, like the voie verte or one of the road-based easy routes around Puivert. That’s one of the things I love about the cycling here: there really is something for everyone! 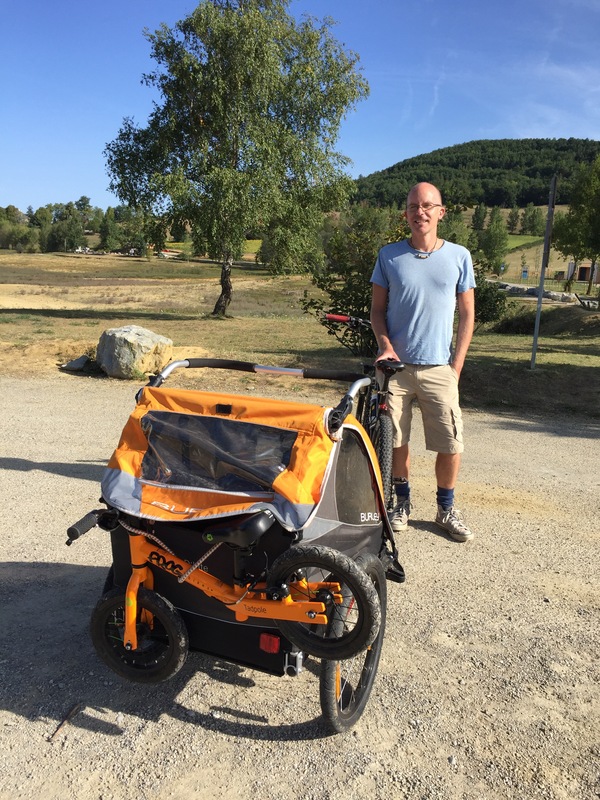 Read all about my second ride to Lac de Montbel in Part 2 (coming soon).